We woke to snow this morning! We have been very lucky to have had beautiful blue skies and sunshine most of the time we have been here so it was bound to happen eventually and this was the very last day of the Championships. We went into the stadium to support Conor who was racing in the Slalom. The first run was horrendous and about a third of the field came out! Conor held on and made it into the 2nd run and Pat, Flo, my Dad and me cheered him into the finish. Uncle E was there again to interview me and Pat! By the time of the 2nd run the snow was falling thick and fast so we retreated to the spectator marquee in Beaver Creek to watch the race on large screens. Conor did well to finish 41st and the shock winner was JB Grange, Marcel Hirscher having come out of the course. In the spectator marquee with Pat and Flo. 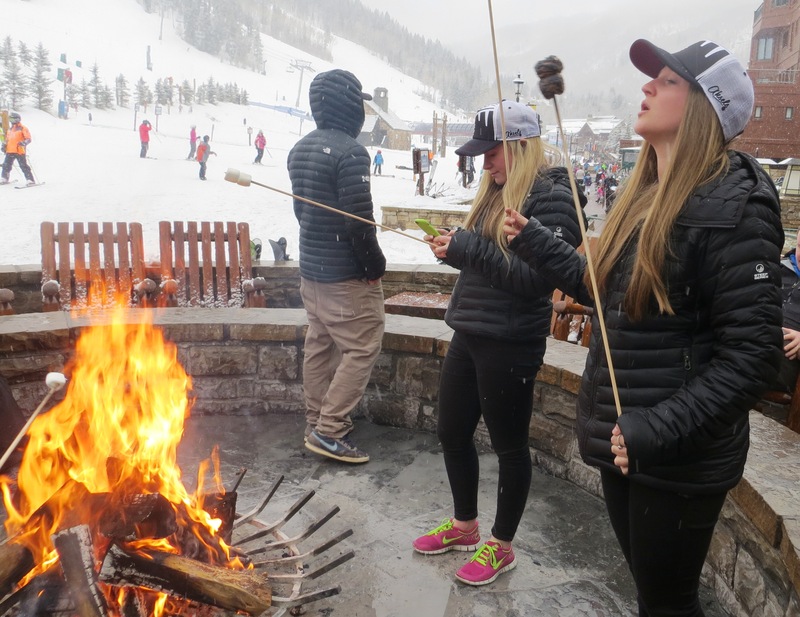 There was only one thing for it - we had to stop for smores before heading back to our base in Vail! Making smores in Beaver Creek.